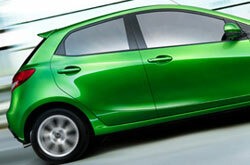 2013 Mazda Mazda2 research and review from Joe Myers Mazda, The trusted resource. Stop worring about your next Mazda purchase; look to the leading Mazda2 dealer in Houston for well researched reviews authored by automotive enthusiasts. This Mazda review article contains everything you need to know about the Mazda2 and it's specifications, mpg and more. Is the Mazda2 right for you? Find out below! Compare the 2013 Mazda Mazda2 against vehicles like the 2013 Honda Fit, Kia Rio and the Ford Fiesta, and you'll find that the Mazda2 out does the competition in various areas. Check out our Quick List below to find out why! Unlike megacorp auto centers, our Houston car repair facility offers legitimate OEM parts, fantastic Mazda trained technicians and a year warranty for all repairs. We're also conveniently situated near several adjacent cities. When you bring your Mazda2 to our auto repair center in Houston, you'll get reliable service from our esteemed mechanics. We handle a slew of jobs with no trouble, including Mazda fuel filter replacement, in-cabin air filter replacement and, of course, more involved tasks like electronics repair - and this is just a chunk of what we can handle. It's self explanatory: If you want pros service and inexpensive repair prices in Houston, make Joe Myers Mazda your first stop for Mazda vehicle maintenance. Find the latest service coupons at Joe Myers Mazda by clicking below this text!